Home / How to Create Canned Responses in WSDesk? WSDesk has become popular thanks to the several advanced features that will help you manage your customers’ expectations in the best possible way. In this article, we will discuss canned responses, which is a convenient feature, in more detail. If you are maintaining a help desk system, you know certain queries repeat a lot. If there is a standard response to these queries, accessible to all support agents, your replies will be much faster. This is why WSDesk provides you an option to create and save reply templates (known as canned responses) for common queries. On WSDesk, you can create canned reply templates from the main ticket dashboard. For this, you will find a message icon on the tickets page. When you click the message icon, you will see the already-created canned responses, as well as an option to create a new template. Creating a new template for Canned Response. Now, when you click ‘Create Ticket’, you will see a new screen pop up with options to edit. 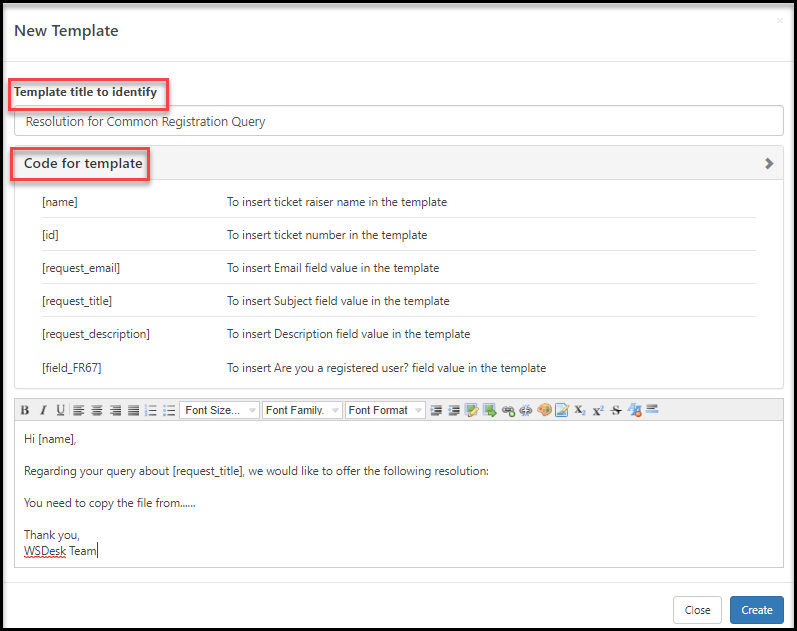 Here, you can create a title for the template, and create a descriptive resolution for the common query that you encounter often. Also, you can use any of the available shortcodes to insert recognizable attributes from the ticket you are replying to. These may be the name of the customer who raised the ticket, the ticket id, the title of the request, etc. Design your email reply in a manner suitable to provide a clear answer for the query. Now, click the Create button to save the response in WSDesk for future use. You can write the body of the mail with shortcodes to insert specific attributes from the ticket you are replying to. How to use canned responses while replying to a customer? Now, let’s see how agents can use the saved templates or canned responses while replying to a ticket. When you open a ticket, you will see a Select Template button. Click this button to display all the available templates that you have saved. Select the suitable template to add it to the reply field. Select the canned response that you want to automatically add to the mail. The response will get pasted on the response field. You can simply send it across to the customer, or add additional information specific to the request. You can see the shortcodes in the reply template has helped to include customer-specific information like name, ticket id, etc. Note: If you want to customize a response using canned responses, you can type the required details and then add a suitable template. The canned responses template will append to the existing text and not override it. 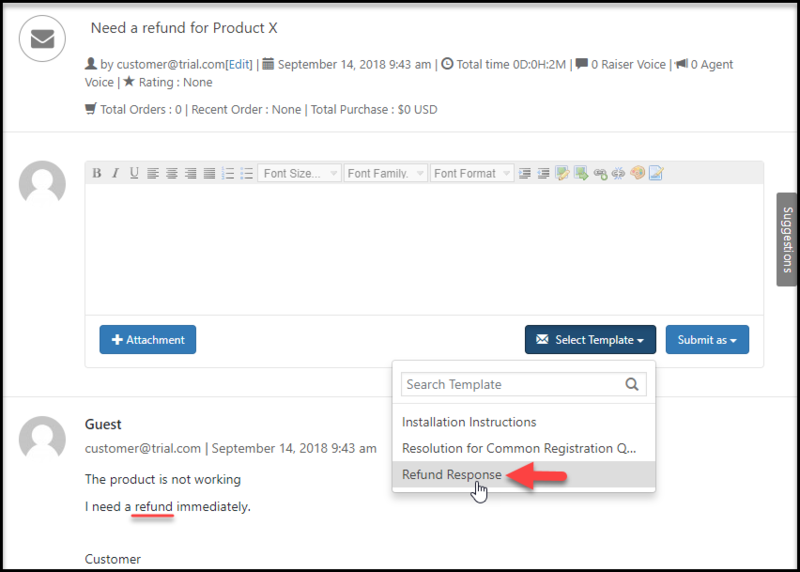 Canned responses, thus can definitely save a lot of time of your support agents, who otherwise would have to type in a detailed response every time a similar query is posted. There are several obvious advantages when you are regularly using canned responses on your help desk system. Saves the time of support agents – Every time a query comes, your support agent doesn’t have to draft a reply from scratch. As some of the queries repeat a lot, you can use the pre-drafted reply instantly. This will save a lot of time for the support agents and overall makes your help desk system more efficient. Makes your responses accurate and consistent – A lot of times different agents might be handling support queries. So, based on the knowledge level and ways of comprehension, the response might differ for the same queries. This might affect your brand’s reputation. If you are using canned responses, you can consistently provide accurate resolutions, even if different agents are handling the tickets. 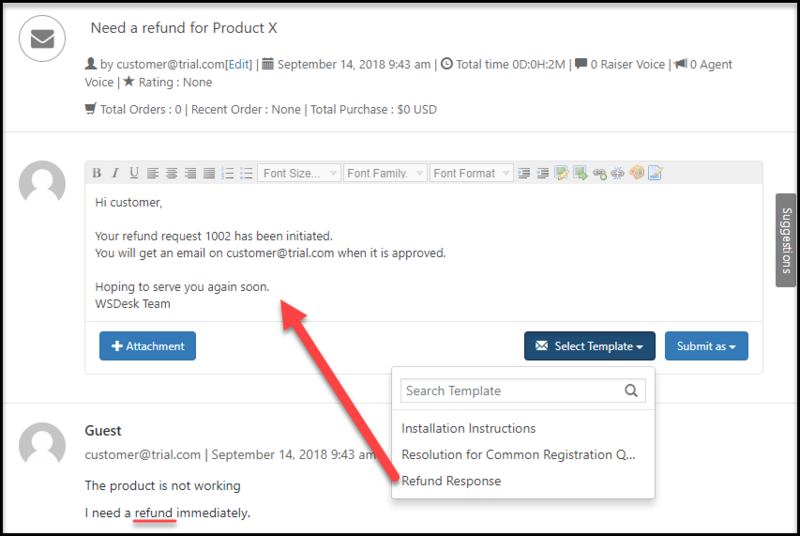 Faster response time – How soon you are responding to support requests is a major factor by which customers judge your store. With canned responses, you can considerably increase your average response and resolution time while handling tickets. Boosts overall efficiency – Canned responses will definitely boost the overall efficiency of your customer response. Even new members of your support team can use them to respond promptly. Moreover, it can help them learn more about a lot of aspects related to your store and products. Hope you got a better idea on setting up canned responses with WSDesk. If you have any query, please refer the documentation or contact customer support.